Robert Downey Jr. might not be Tony Stark, but he is pretty close. He can retire any day with a clear conscious, and not because he is a bad actor. Rather because he has earned so much, he probably doesn’t need to work anymore. According to Men's Health, the actor is likely to have around $300 million in the bank. But this is just for now. With more Marvel movies coming up in the future, the number will keep skyrocketing even higher. But what does he do with all these money? After seeing his gorgeous windmill house In Hamptons, we know the answer. Architectural Digest opened a door to the 53-year-old actor’s beautiful Hamptons house, giving a once-in-a-lifetime tour for its readers. Flicking through the pages of the magazine, we can see Robert Downey Jr. posing with his wife, Susan, and their children. The Downey family proudly showcases the 19th-century windmill house that was transformed into their dream home with the help of a designer Joe Nahem. We didn't set out to do something conspicuously wacky. We just enjoy a bit of whimsy and fun. And we definitely don't like boring. 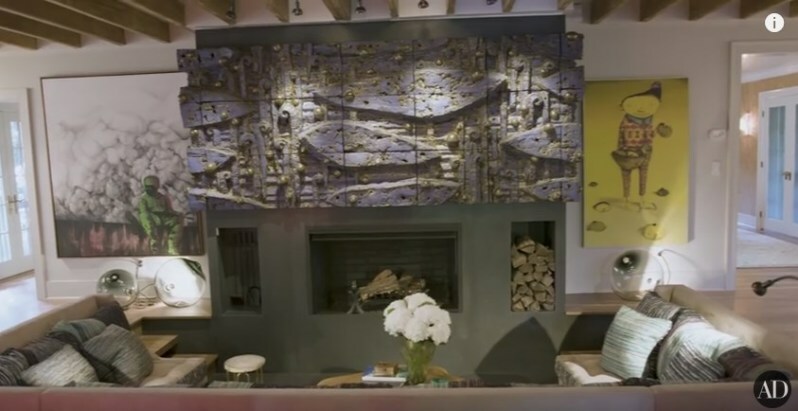 Robert Downey Jr's sculptures in his summer house, The Hamptons were made by Andrius Petkus! Nahem found the extraordinary place and turned into the Downey’s residence. He also created a 'poolside pavilion' for the family and their friends to enjoy. The property is filled with cool architectural details that make it quite unique inside, as much as outside. Take a look at the tour around the house in the video below. What do people think about the place? Would you like to live in a house like this or do you think that Robert's cats are the best part of it?